If your first experience with grappa was a memorably bad one, you’re not alone. Like shots of cheap tequila, many people get their first taste of grappa in the worst possible way – while reveling at a bar with friends, for example, when the bartender puts out a tray of free grappa shots made from low-quality pomace that burns down the throat and leaves a rather unpleasant association forever after. If that was the case with you, don’t give up on grappa just yet, because good grappa can be a pretty marvelous experience. It’s a great `closer’ after a delicious evening meal, and the Italians even “correct” their after-dinner espresso with the stuff. It’s an excellent digestif that cleans the stomach, and when mixed with Prosecco, grappa makes a wonderful aperitif or a highball drink. 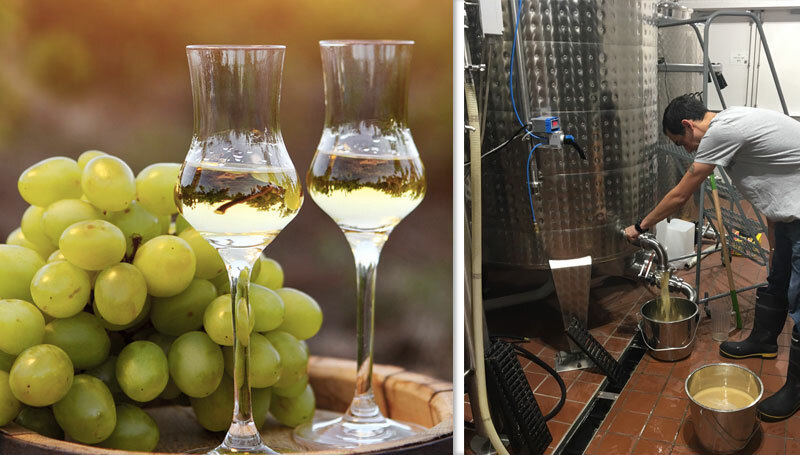 Distilled from pomace – the skin and seeds that remain after the winemaking process – the quality of grappa is determined by the quality of the grape. Given that low-quality wine is produced and bottled in abundance, there is enough skin and seeds left over to make similarly substandard grappa that gives this Italian favorite a dubious reputation. But when fine grappa is made for considered consumption, it’s a wholly different experience. Which is why Wildwood Spirits is proud to announce Ärande (Swedish for `homage’) made from the finest pomace produced by WT Vintners in Woodinville. “We trucked 900 pounds of Chenin Blanc pomace from winemaker/owner Jeff Lindsey Thorsen’s winery in Woodinville,” says head distiller Erik Liedholm. “The grapes were pressed immediately to ensure freshness and to avoid any microbiological issues. We fermented the pomace using a Burgundy yeast strain for two days before pot distilling.” Ärande will be bottled at 90 proof and show great Chenin Blanc aromas and flavors of red apple and white flowers. • The best way to enjoy Wildwood’s Ärande grappa is in a tulip-shaped glass with an open rim that allows the unique aromas of the distillate to emanate nicely. A 3.5 oz-5 oz sized glass is ideal. • In Italy, it is a common practice to drink grappa straight out of the freezer. Though this robs some of the flavor, the chilled crispness of grappa that comes out of a freezer is favored by many grappa connoisseurs. The Nazionale Grappa – association of grappa producers in Italy – suggests serving young grappa (white grappa Bianca, like Ärande) between 48-55 degree F, and aged grappa (golden-brown Riserva) at around 72 degrees F.
• Let the grappa rest for a few minutes after pouring to allow it to breathe. • The unique aroma of grappa is best enjoyed in short spurts. Don’t breathe deep in it. • There is risk of grappa getting corked if the bottle is stored in a horizontal position and the liquid stays in contact with the cork. Always store grappa bottles standing. Avoid direct sunlight and heat as well because they impact the aroma.